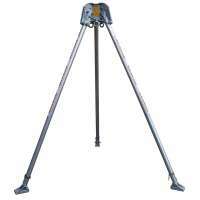 The Abtech safety RT3 two person rescue tripod is tested to EN 795 standard and has six anchor points. It features three overhead pulleys which can hold up to 11mm thick rope. Featuring additional swivel anchor points, the Abtech RT 3 can be safely used with pulleys to provide a double roped rescue backup system, communication lines, medical kits, airlines, tools and so on. The RT 3's tripod legs can be individually adjusted allowing for maximum stability. It also features three overhead pulleys and three swivel eyebolts for attachment points. You can attach lanyards to the feet in order to pin it to the floor and the tripod head has the facility for anchor lines to be attached for extra safety. 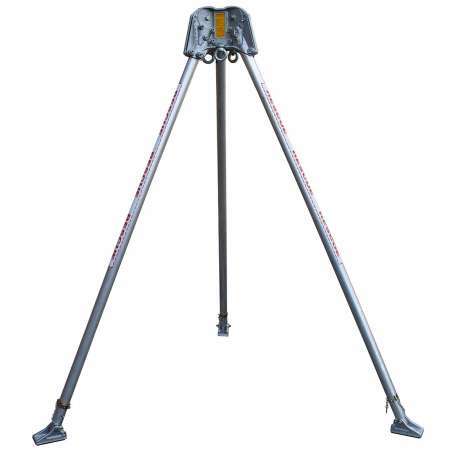 This tripod is ideal for safety rescue where an injured person on a stretcher may be vertically raised clear of the entrance due to the tripod are being so high (200cm - 260 cm). Being so well-designed and sturdy in construction it can handle a safe working load of 250 kg at a 6 to 1 safety ratio. This unit weighs in at 21.5kg and the recommended service interval is every 12 months. The Abtech RT3 two-person rescue tripod is in full compliance with modern standard (BS EN 795 type B).